1743, borrowed during an outbreak of the disease in Europe, from It. influenza "influenza, epidemic," originally "visitation, influence (of the stars)," from M.L. influentia (see influence). Used in It. for diseases since at least 1504 (cf. influenza di febbre scarlattina "scarlet fever") on notion of astral or occult influence. The 1743 outbreak began in Italy. Often applied since mid-19c. to severe colds. Formed, under the influence of Italian influenca, from השפיע (= he influenced) according to the pattern פעלת, serving to form names of diseases ... The disease was called influenca because it was originally attributed to the influence of the stars. In the course of discussing various afflictions and the methods of their purification, parashat Tazria lists a number of diseases and bodily conditions: baheret ["white discoloration"] (13:4), tzarevet ["scar"] (13:23), sapahat ["swelling"](13:2), tzara'at ["leprosy"], karahat ["baldness of the top of the head"] (13:42), gabahat ["baldness of the sides of the head"] (13:42). These terms all share a common grammatical form: although some of the words vary from it slightly due to the presence of a guttural stop. When spoken Hebrew awoke to life in the end of the nineteenth century it needed new words to describe new diseases. Rabbi Aharon Meir MaZIA, an ophthalmologist and aboriculturalist who chaired the Language Committee (which eventually became the Academy for the Hebrew Language) from 1926 until his death in 1930, composed a lexicon of medical and scientific terms. In order to invent names for diseases that were never mentioned in classical Hebrew sources, MaZIA and others following him used the biblical form for disease names - , a form exemplified repeatedly in our parashiyot - in combination with new roots. For instance; rubella, a disease that causes redness of the skin, is called ademet [adom = red]. Hepatitis, which causes the eyes to acquire a yellow hue (we will come soon to Hebrew's new color-terms), is called tzahevet [tzahov = yellow]. Edema, the pathological retention of fluids in the body, is called batzeket [batzek = swollen]. Rabies, a viral disease often found in dogs is called kalevet [kelev = dog]. One who coughs [mishta'el] may be suffering from sha'elet [pertusis]. The term influenza originates from reference to the occult influence [hashpa'a] of the stars, and so it is called shapa'at. Many suffer tiredness [ayeifut] from jet-lag, or ya'efet, one of the more recent words to be invented by the Academy of the Hebrew Language. Sometimes it took a while for a word to really enter the language; some never make it at all. For example, Eliezer Ben Yehudah, the greatest reviver of Hebrew, wished to call tuberculosis (a disease from which he personally suffered) genihat hadam ["groaning of the blood"], but the term shahefet - which follows the standard form for disease-names and is of biblical origin - ended up taking its place. The vitality of Hebrew is evidenced by the way names for social ills are invented in accordance with the schema mentioned above. For instance: sahevet [taking too much time to execute an action, from sahev = to drag or carry with effort] and sagemet [megalomania of young officers, from sagam = second lieutenant]. Many public speakers are chronic suffers of daberet [loquaciousness, from dibbur = speech], or worse yet, barberet [speaking nonsense, from levarber = to babble]. Neither Klein nor Marx say exactly when shapaat entered modern Hebrew. 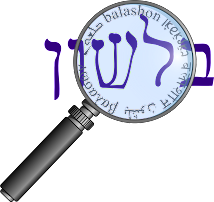 In Ben Yehuda's dictionary, it says that the word is "found in literature and speech." He doesn't indicate that he coined it - and I've seen that description used for other modern words that I know he didn't coin. I wrote to the Hebrew Language Academy asking if they knew when the word was first used. They pointed me to the following entry in Ben Yehuda's newspaper Hatzvi, from July 21, 1893. He describes the outbreak of a disease called אינפלואינצה - influenza, which he later calls shapaat. In a footnote there, he notes that shapaat is "the Hebrew name, according to the naming pattern for diseases, for influenza, according to the meaning of that word." In the following issue, he mentions shapaat three times - each followed by influenza in parentheses. What's strange for me here, is that most European languages weren't calling the disease influenza. As you can see here, in Russian, French and German (among others), it was called "grippe". Only in English and Italian was it called influenza - neither of which I'm guessing were well known by the Jews living in Palestine in 1893. So it doesn't seem likely that the average person called the disease "influenza" and therefore the name shapaat came somewhat naturally. What's also strange about the word, is while it does seem to follow the pattern as the other diseases above, it's a much less understandable one. Ademet, tzahevet, kalevet - the connection between the condition and the name was very clear. But I doubt most non-linguists knew the centuries old etymology of influenza and therefore figured shapaat was a good name for the disease. Couldn't some aspect of the disease - which Ben Yehuda describes at length in the first article - been used to come up with a Hebrew term? Originally, the word [influence] was used astrologically to describe power that flowed from the stars and controlled a person's destiny. In the centuries that followed, influence came to refer to the effect of nonastronomical forces such as alcohol ("under the influence") and germs (influenza, later clipped to flu) and especially financial power.